Did I need more than beets and arugula to make a delicious salad? Not really (hello, remember this one?! ), but feta added some nice creaminess and the pecans added some crunch. And since I’ve recently picked up a particularly taste bottle of balsamic at the farmer’s market, I’ve been putting it on a lot of my eats, salad dressings included. Thusly, the dressing was a no-brainer. So easy, so right. Nom! This salad makes a great use of leftover roasted beets. The key to ease of preparation is having the beets ready already. If you don’t have leftovers, you actually can get ready-t0-eat beets at some grocery stores (I think I’ve seen them at Trader Joe’s). The combination of beets and arugula is particularly tasty, but feel free to switch out the greens for something else (no, I don’t recommend leaving off the beets! hehe). Heck, you could even switch out the cheese and nuts for different types. Tweak the combination of ingredients to your taste. I prefer this salad as a side or light lunch/snack. You can mix all the ingredients up, but I prefer to layer mine, starting by piling the arugula leaves in a tall pile on a large plate. 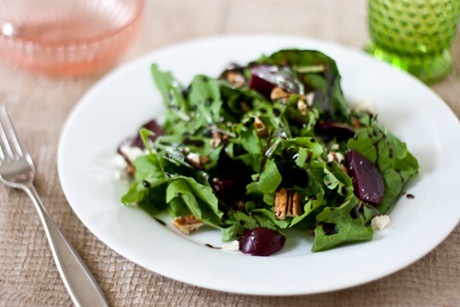 Place beets around the arugula leaves. Sprinkle feta over the salad. 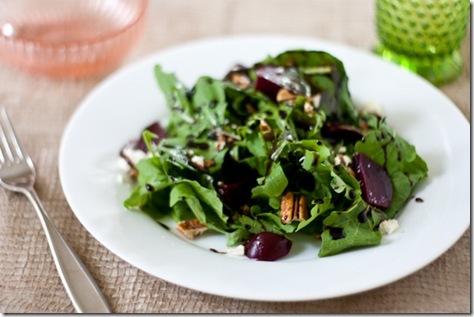 Sprinkle pecans over the salad. 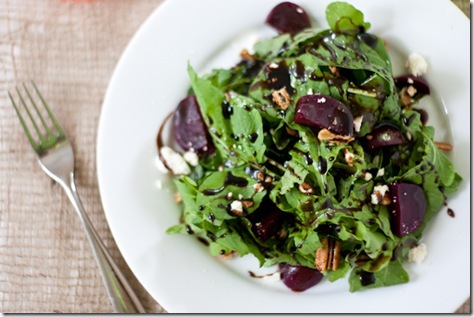 Drizzle salad with Quick Balsamic Dressing and enjoy! I’ve heard different things about proportions of oil to balsamic. I found one-to-one worked ok for this salad, but maybe that’s because I really, really like balsamic. 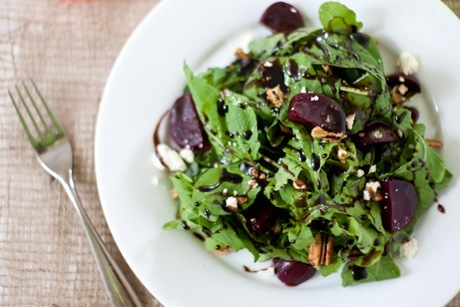 Use a really good quality balsamic for the best flavor. Combine balsamic vinegar, salt, and pepper in a small bowl. Drizzle in extra virgin olive oil while whisking until mixture is emulsified. Add additional salt and pepper, if needed. love your blog sweetie! that salad is simple and perfect! i love pecans with spinach! 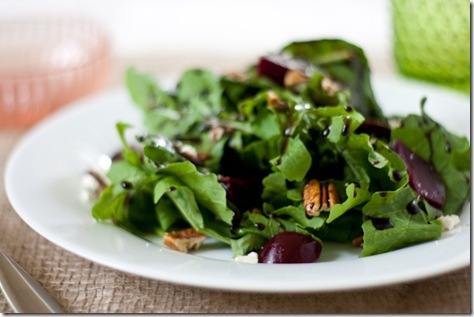 I’m still not a beet lover, but I bet I would love them on this salad- looks so fresh and delicious! I adore arugula. My favorite salad green by far! Oh how I love green peas – and oh how my husband hates them. Sad. We both love beets though – can’t wait to try your salad this weekend. YUM! I googled beets and arugula and found this page. this is REALLY good! We will make this again. Thanks for the recipe!